The potential of virtual and augmented reality are endless. It has been introduced and used in many areas besides the gaming industry. 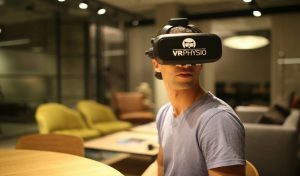 The CU Boulder’s Counseling and Psychiatric Services (CAPS) introduce the use of VR with traditional therapy techniques to treat students through their mental health conditions such as phobias and anxiety by allowing them to fully immerse in the environment. However, this kind of integrated exposure therapy has been very limited on college campuses due to the lack resources available. CAPS Director Monica Ng had putted enormous efforts in introducing a suite of nontraditional counseling options for students and hoped that the virtual reality therapy can help students make meaningful progress towards their mental health. CAPS is working with the Community and Behavioral Health department in the Colorado School of Public Health at CU Denver to create customized therapy programs for students with anxiety by simulating real-world CU Boulder classrooms. Even though the potential of VR is endless and it’s revolutionizing healthcare, the resources providing and/or offering the service is still limited. Whenever I think of virtual reality I always associate it with video games. I never actually thought about it being used for more than that, so this is very interesting for me. I think using it to help people get over phobias and face their fears and help with anxiety can be really beneficial, They can put these patients in front of the things they’re scared of, or at least make them feel they are in front of it, without actually having them do it in real life. I think; although it would be scary, knowing that they could always turn the VR system off at any time could help them face their fear and possibly eventually get over this fear. This type of therapy is definitely something I would try.